Established in 1983, The Topcats have racked up an impressive list of achievements. In August of 2014 and August of 2013, The Topcats received honorable mention in Gambit Magazine's "Best of New Orleans" readers polls for 2014 and 2013. In both polls, the band came in third place in the "Best Local Rock Band / Artist" category behind Better Than Ezra and Cowboy Mouth! While coming in third place might not be much to shout about, the guys were really excited, considering who came in first and second, two of the Louisiana's most successful, national bands. The Topcats would like to thank Gambit Magazine and all who voted for The Topcats! 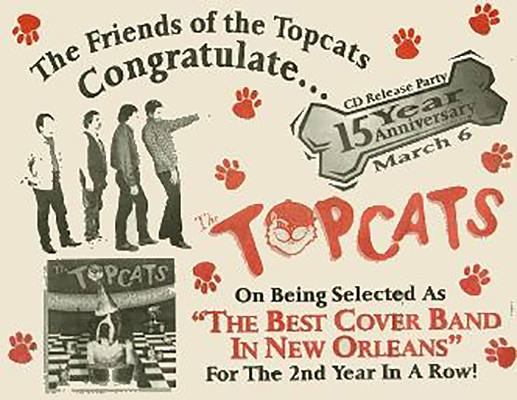 In January of 2009, The Topcats were chosen Best Local Band in New Orleans Magazine's "New Orleans' Best" reader's poll! This is a huge honor for The Topcats. New Orleans Magazine is one of New Orleans' oldest and most prestigious magazines, and The Topcats are extremely proud of their selection. Check out the graphic from the January issue of New Orleans Magazine. On Friday, March 14th, 2008 The Topcats celebrated twenty-five years together, rockin' and rollin', day in and day out! The band has been very fortunate to be able to make a living doing what they love while staying together for the past two and a half decades. As bands come and go, this is a major accomplishment for The Topcats! The guys put on a very special, multimedia show at Southport Hall to celebrate the landmark event. As promotion for this event, the band appeared on the WWL-TV Morning News Show on Monday, March 10th, and on the morning of March 14th, The Topcats were featured in the lead off article in the music section of the Lagniappe, the entertainment section of the Time Picayune. 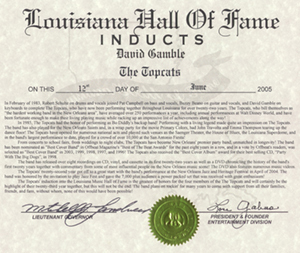 On June 12th, 2005, The Topcats were inducted into the Louisiana Hall of Fame! The induction ceremony took place at Boomtown Casino where The Topcats were the first of numerous acts to be inducted for 2005. The band started out by playing a power packed, forty minute, set to a packed house. The response was amazing! The guys brought the house down! After their set, Lou Gabus, the president and founder of the Louisiana Hall of Fame's Entertainment Division, presented David, Buzzy, Pat, and Rob each with personalized certificates of induction! The whole ceremony was extensively photographed and video taped, so if you were not able to attend the presentation, photos and video will be available in the future! The guys in the band are extremely honored and proud of this remarkable achievement and wish to first thank their families, who perhaps make the largest sacrifice for this kind of success! Gig after gig, day after day, weekend after weekend, year after year, and decade after decade, they stick by their husbands and fathers! The band also wishes to give a special thanks to Frank "Biddy" Robert, the band's one-man super crew! Frank has been driving the truck, setting up and tearing down the show, doing sound and lights for well over 15 years now! These past years without him would have been difficult to say the least! Last but not least, the band also wishes to thank Sal Candilora and the former members of TQ & The Topcats who, from the early 70's until 1983, laid the ground work for The Topcats' present day success. Sal, who sang with The Topcats until 1987, remains a special part of The Topcats. Check out all of these previous members on the Topcats' Chronicles page. Check out the image of David's Induction Certificate above. It's official! Signed by Mitch Landrieu, Lieutenant Governor for the state of Louisiana, and Lou Gabus, the president and founder of the Louisiana Hall of Fame's Entertainment Division! Click on the image to enlarge and scroll to read the fine print. The band again received one of its greatest honors by being voted "Best Cover Band" in Offbeat Magazine's "Best Of the Beat Awards" for 2007. In December, 2007, The Topcats were nominated for this award with two other very popular bands in the New Orleans area. The Topcats won the voting and received the "Best Cover Band" award at an awards ceremony on January 12th, 2008, at the House of Blues in New Orleans. This was the sixth time The Topcats received this award, as they were also voted "Best Cover Band" in January of 1996, 1997, 1998, 1999, and 2003! The band's 1998 release "Party With The Big Dogs" was also voted "Cover Album of the Year" in Offbeat Magazine's "Best Of The Beat Awards" for 1998. The band has been nominated for the best cover band award every year since 1996, which is truly an honor as the nominations are made by people in the New Orleans music industry! Check out the Best of The Beat Awards The Topcats have won! 2003 was a landmark year for The Topcats. The band celebrated its twentieth year together, which in itself, is a huge accomplishment. This banner year was celebrated with the release of The Topcats 1983-2003, a double CD set encompassing twenty years of live and studio Topcat recordings, as well as The Topcats 1983-2003 DVD and VHS, a video history of The Topcats, along with numerous Topcat videos! These items were released on April 11, 2003 at The Dock where the band held its first anniversary party which was attended by over 1500 people! Later in the year, the band also celebrated with a special performance in Disney World as well as a seven day, Topcat cruise aboard the Carnival Conquest! 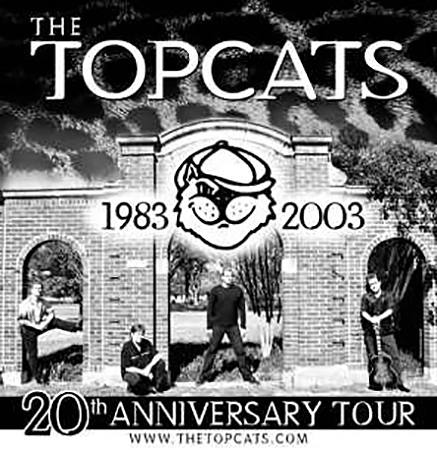 On September 13, 2003 The Topcats' Twentieth Anniversary year culminated with the band's first headlining appearance at the House Of Blues in New Orleans, which will be remembered for a long, long time. Check out the twentieth anniversary poster, and an article that appeared in the Times Picayune's Lagniappe on April 11, 2003! 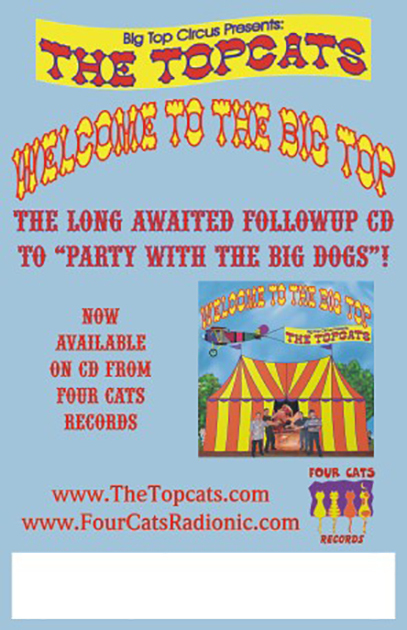 In June of 2002, The Topcats released "Welcome To The Big Top" to a packed house at Rock'n' Bowl. The CD release was well publicized as seen in the Times Picayune article above written by Keith Spera. The Big Top Poster also publicized this event as well an appearance on WCKW 92.3FM The Point in New Orleans. "Follow You Down", an original tune on "Welcome To The Big Top", also received extensive air play on WCKW! 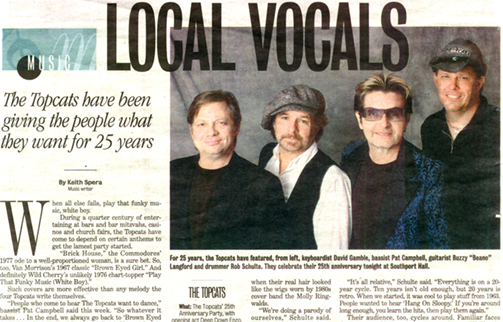 During the week that preceded The Topcats' fifteenth year anniversary party, the band received considerable press coverage. The band appeared on WWL TV's morning news show, and they were interviewed live on B97 and WTIX radio. Below are images of articles that appeared in Gambit, Offbeat, and Lagniappe magazines. Check out the image below of a full page advertisement that appeared on the back cover of Gambit magazine in the week preceding the anniversary party. The ad was sponsored by some of the band's favorite clientèle.